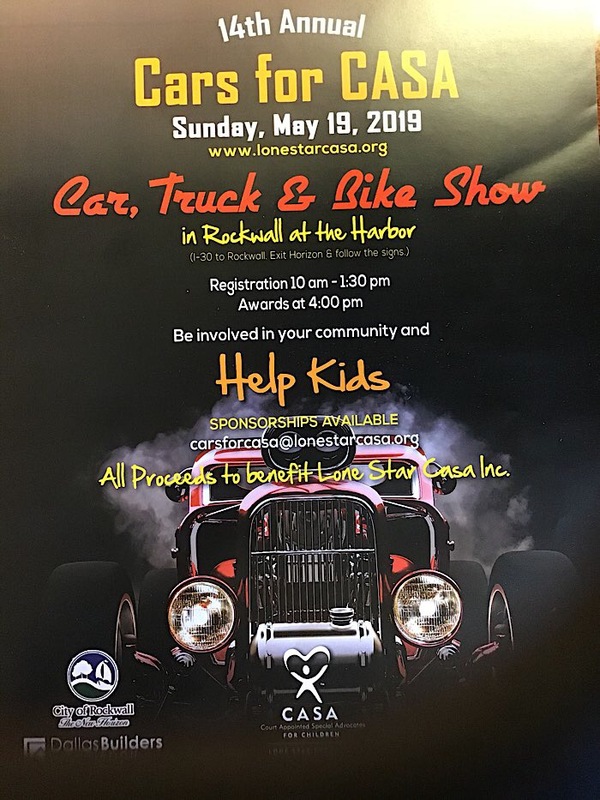 Fourteenth Annual "CARS FOR CASA" - Sunday - May 19th 2019 1st & 2nd Class Awards will be presented for Cars (28 categories), Trucks (5 categories) and Motorcycle (7 categories). Awards also for Best of Show - Car, Truck, Motorcycle and Rat Rod. Your vehicles' will be judged on Best Engine, Best Graphics, Best Paint, Best Interior and Best DBA Members Award. Bring all of your club members as there is also a Club Participation Award. 100% of the proceeds go to "LONE STAR CASA, INC". The mission of CASA (Court Appointed Special Advocate) is to speak for the best interest of abused and neglected children in the courts. They promote and support quality volunteer representation for children to provide each child a safe, permanent, nurturing home. This Sunday afternoon event has had in excess of four hundred (400) cars participate and approximately three thousand spectators. We are extremely pleased to have raised almost $500,000 to date for Lone Star CASA.